Fruits with carpels reddish, ovoid-round, ± 2–3 cm long, 1.5–2 cm high, 1–1.5 cm thick, apex shortly rostrate, glabrescent. The seven specimens available suggest that this spectacular species is known for certain from only two small forest sites (Longo Mwagandi in Shimba Hills and Pangani Rocks) in Kenya and one in Tanzania, at Bulwa. Protection at the first site is currently of concern due to a conflict in management (Luke pers. comm.). The Tanzanian site consists of less than 5 individuals in a 12.6 ha disturbed forest fragment near Bulwa in which this is the only Cola (Cordeiro pers. comm. 2001–2003). Although disjunct altitudinally (by ± 500 m) and geographically from the two Kenyan sites, careful comparison of the complete material obtained through Cordeiro reveals no significant morphological differences. 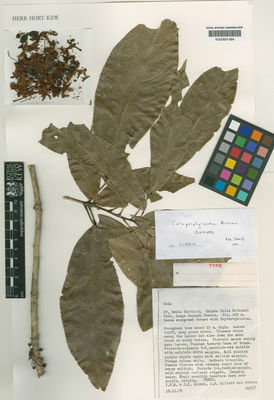 Cola porphyrantha is here assessed as EN B2a,b(iii) i.e. Endangered. IUCN (Red List 2002, www.redlist.org) also list this species as endangered (EN B1+2c). Cola porphyrantha falls in the “ C. stelechantha group” (see notes under the last). The species are easily separated using the characters in the key. Flora districts: K7 T3 Range: Not known elsewhere. The fruits are edible ( Magogo & Glover 1080).